Some Muslim Women Are Taking Self-Defense Into Their Own Hands Anti-Muslim sentiment is on the rise, and Muslim women wearing hijabs can be particularly vulnerable. That has prompted two women in New York to organize an all-female class for observant Muslims. About two-dozen Muslim women attended a recent self-defense class in New York City. It's not an easy time to be Muslim in the U.S. Attacks on mosques are at a record high, according to the country's largest Muslim advocacy group. Women wearing hijabs, or headscarves, are often singled out for harassment. That has galvanized some to take their protection into their own hands. On a recent day, some two-dozen Muslim women — nearly all of them wearing hijabs — have crowded into a studio in Midtown Manhattan. They are sparring with instructor Nicole Daniels. One of the women smacking Daniels' glove is Amirah Aulaqi. She and friend Mariana Aguilera, who is also Muslim, decided to create the class after the attacks in Paris and in San Bernardino, Calif. They're concerned by the antagonism they see directed against Muslims. "We want you guys to leave this class and not feel like victims, because you're not victims," Aulaqi tells the class. There were no men allowed in the class — and only Aguilera, one of the organizers, had a camera. Aulaqi and Aguilera created the class for observant Muslim women. That population is particularly at risk, because their hijabs can make them stand out. There have been incidents of verbal abuse — in some cases, people have yanked at women's headscarves. Usually it's curiosity. But now it's a more hateful stare. And it's not a good feeling. "We want you to go out and say, 'I'm a Muslim woman and nobody has the right to take my dignity or freedom within this country,' " Aulaqi says. The class sold out in an hour. It drew women not just from New York City, but New Jersey and Connecticut as well. The only students who were willing to be interviewed are longtime New Yorkers with careers. 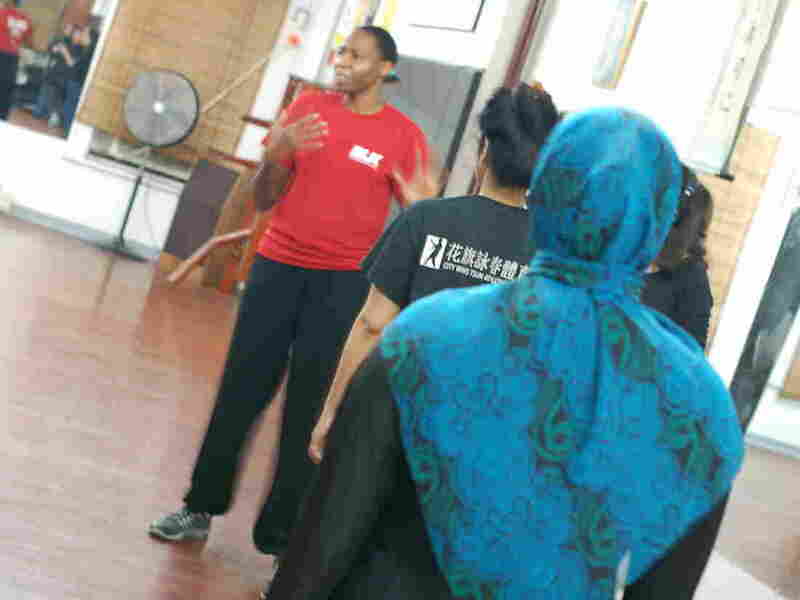 "I'd never thought I'd actually see myself in a self-defense course," says Fatiha Ahmed, who was born in Queens, N.Y., to Bangladeshi parents. She is a teacher and attended the class with her three sisters and two sisters-in-law. She signed up because she has been feeling uncomfortable wearing the hijab on the subway. People looked at her before, but she says it feels different now. "Usually it's curiosity. But now it's a more hateful stare. And it's not a good feeling," Ahmed says. She is particularly concerned about her sisters-in-law, who came to the U.S. from Bangladesh in the past few years. "They are very timid," she says. "They've had experiences where people have said hateful things toward them. They ran away, they ran home, they didn't want to go to work for a few days." Both of Ahmed's sisters-in-law declined to speak with NPR. Her older sister, Sabji Ahmed, is a nurse and a classic New Yorker. "When I walk around, I don't put my head down to be the victim," she says. "And if I see a couple of guys, I make sure I give them the look and say, 'Yes, I know you're standing there.' "
Sabji Ahmed says she attended the class to see if there were self-defense techniques, and not just attitude, that she could teach her three teenage daughters. "It was more for them. They couldn't make it today for other reasons," she says. Nadia Alemare was born and raised in New York and is a single mom to an 11-year-old boy. She says she hasn't encountered much harassment, but her son has, coming home from school. "He was like, 'Mom, I had these kids chase me down and they kept saying I'm a terrorist, go back to your country.' And I was very scared for him," she says. What concerns Alemare most is how the incident crystallized for her son that people can identify his ethnicity and that it makes him vulnerable. "He was like, 'Mom, do I look Arab?' For him to even feel inferior just because of the way he looks, that in itself kind of bothered me," she says. Alemare says she is going to tell her son what she learned in this all-female class. The organizers are planning to make it a regular event. It's not just about preparing the students to deal with physical attacks. It's also a way to make them feel supported at a time when it can be challenging to be an observant Muslim.